When you’re looking for new church furniture, you might be in a pickle about what to do with your old church furniture. Church pews can be a huge hassle to get rid of because they’re so large and cumbersome to transport and not all church furniture is in condition to be restored. There are a number of different things you can do with your old church furniture, including using it as trade-in value for new church pews. At Born Again Pews, we only sell restored church pews when they are good quality church pews that will stand up to another fifty years of use. 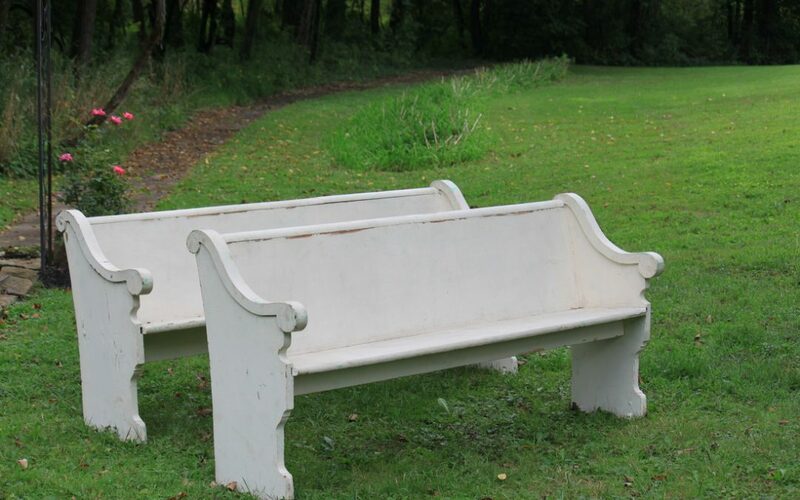 For churches that are looking for a low cost solution, restored church pews can look very appealing but there are some possible disadvantages to them. Quality can vary widely and often you don’t know what you’ll get till they arrive. We often take old church furniture for credit when we install new church pews but not all churches want to go that route and we can’t always accept all furniture. So what can you do with used church furniture you can’t trade in? The most obvious solution is to sell it to another church that needs furniture. New churches that don’t yet have funds to buy new furniture are typically on the lookout, even if the pews are in bad shape. It all depends on the quality of your church furniture and where you’re located. Shipping the furniture to another church can be costly and complicated. If your old church furniture can’t be resold to another church, it can often be used in other ways. More and more people are looking for church pews for home décor. They’re popular in breakfast nooks and entryways, especially for families that want to bring the church and the Lord into everything they do. One great way to raise money for your new church pew replacement is to sell off church pews to the community. Another solution is to sell your church pews to photographers, wedding planners, and event companies. Many event companies are on the lookout for old church furniture sold as is. A popular option for these companies is to distress or antique the pews and turn the furniture into a beautiful wedding setting. We can help you figure out a good solution for your old church furniture, so give us a call or include information about your old pews in our free quote form to find out more.